SUMTER, SC — Maria Kokotinis, a loving mother and grandmother and a longtime Sumter, SC resident, died peacefully surrounded by family on Saturday, January 26, 2019 at the age of 86, after a long battle with dementia. Maria or more fondly remembered as Yiayia Maria, was born to Theofanis and Angeliki Antanopoulos in Australia on November 11, 1932. 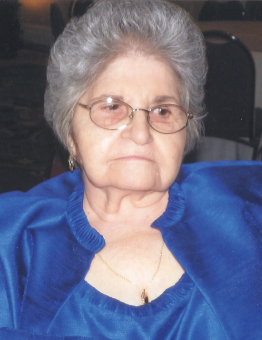 Maria was raised alongside her brother, Ioannis Antanopoulos and sister, Golfo Kakouras in Karpenisi, Greece and immigrated to the United States in 1962, after marrying her husband, the late Ioannis Kokotinis. Maria and Ioannis made their home in Pulaski, VA, where they owned a Greek American restaurant. Maria moved to Sumter, SC in 1989 to help her daughter Helen raise her girls. A two-time cancer survivor known for her generosity and hospitality, Maria loved cooking her famous feta cheese and spinach pitas and homemade greek yogurt for family and friends, gardening, reading, knitting and watching Greek films. Maria dedicated herself to her family and her church and enjoyed spending the summers traveling back to Greece. May her memory be eternal. Maria is survived by her loving daughters; Eleni “Helen” Ouzounidis, and husband Athanasios (of Sumter), Angeliki “Kiki” Papadoupoulos (of Athens, Greece), her grandchildren; Dr. Stefanos Papadoupoulos, his wife Irini and daughter Emelia, Ioanna “Joanna” Ouzounidis Murphy and husband Sean, and her namesake, Maria Ouzounidis. Helen was Maria’s caretaker for 10 years; they shared an unconditional love and a special bond that was inspiring to so many. A visitation will be held on Tuesday, January 29 at the Bullock Funeral Home, 1190 Wilson Hall Rd, Sumter, SC 29150, from 5-7 PM. Maria’s funeral service will be celebrated on Wednesday, January 30, 2019 at 12:00 pm in the Bullock Funeral Home Chapel. In lieu of flowers, donations may be made to the Holy Trinity Greek Orthodox Church, 1931 Sumter St, Columbia, SC 29201 or to the Alzheimer’s Association Mid-State SC Chapter, P.O. Box 7044, Columbia, SC 29202-7044.